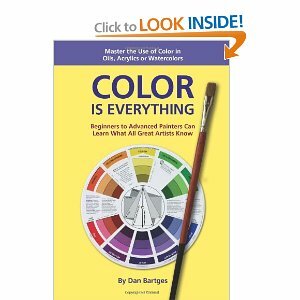 Color is Everything is a great choice for getting started with painting in any medium. It’s also a good introduction to color theory and harmonizing colors in your paintings. You will learn about the different tools, equipment and paints for acrylics, water colors and oils. Other great features are, learning how to effectively use the color wheel, learning the 6 color schemes and exploring examples of how great masters use color effectively in paintings. The book is only 96 pages, easy to read and follow at a good pace. also check out other books and resources I’ve reviewed on color theory for further study. You are currently browsing the archives for the Painting in Oils Acrylics Watercolors category.